A clearer picture of what causes Alzheimer's disease is emerging after the largest ever analysis of patients' DNA. A massive international collaboration has now doubled the number of genes linked to the dementia to 21. The findings, published in the journal Nature Genetics, indicate a strong role for the immune system. 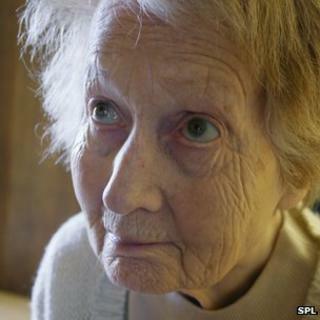 Alzheimer's Research UK said the findings could "significantly enhance" understanding of the disease. The number of people developing Alzheimer's is growing around the world as people live longer. However, major questions around what causes the dementia, how brain cells die, how to treat it or even diagnose it remain unanswered. "It is really difficult to treat a disease when you do not understand what causes it," one of the lead researchers, Prof Julie Williams from Cardiff University, said. The genetic code, the instructions for building and running the body, was scoured for clues. A group - involving nearly three quarters of the world's Alzheimer's geneticists from 145 academic institutions - looked at the DNA of 17,000 patients and 37,000 healthy people. They found versions of 21 genes, or sets of instructions, which made it more likely that a person would develop Alzheimer's disease. They do not guarantee Alzheimer's will develop, but they do make the disease more likely. By looking at the genes' function in the body, it allows researchers to figure out the processes going wrong in Alzheimer's disease. Prof Williams, the head of neurodegeneration at Cardiff University, told the BBC: "We've doubled the number of genes discovered and a very strong pattern is emerging. "There is something in the immune response which is causing Alzheimer's disease and we need to look at that." The way the body deals with cholesterol and the way cells in the brain deal with big molecules in a process called endocytosis also seem to be involved. It now needs other research groups to pick up on the findings, work out exactly what is going wrong and develop treatments. This could include drugs, genetic therapies or changes to lifestyle. Dr Eric Karran, the director of research at Alzheimer's Research UK, said: "By mapping the genetics of the most common, late-onset form of Alzheimer's, these findings highlight new biological processes that could significantly advance our understanding of this devastating disease. "While this new discovery holds real potential, the true value will come from pinpointing the exact genes involved, how they contribute to Alzheimer's, and how this could be translated into benefits for people living with the disease." Dr James Pickett, head of research at the Alzheimer's Society, said: "This exciting discovery of genes linked with Alzheimer's disease opens up new avenues to explore in the search for treatments for the condition. "We now need continued global investment into dementia research to understand exactly how these genes affect the disease process."